First off, this is arguably a jazz rather than progressive rock release. I’d say, though that much of the music crosses into more prog territory. Besides that, just the idea of re-thinking rock songs into a jazz style is rather prog. Then, when you add the presence of Dylan Howe’s father Steve Howe (Yes, Asia and more) on one of the songs, this gets put under progressive rock at Music Street Journal. With that out of the way, what to make of this set? 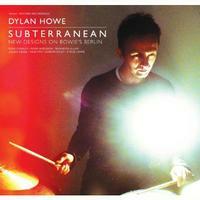 Well, Dylan Howe interprets several pieces from David Bowie’s Berlin era. I have to admit that I’m definitely a fan of Bowie, but I don’t really remember these particular pieces in their original form. So, to me they are new. They are also compelling. The music has a tendency toward the mellower end of the spectrum. Don’t, for even a moment, read that as “boring,” though. This is quite strong instrumental work. There isn’t a moment here that doesn’t work extremely well. I’d highly recommend this to any fans of instrumental music. 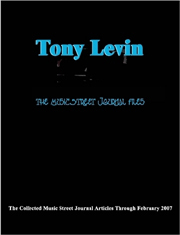 This review is available in book format (hardcover and paperback) in Music Street Journal: 2015 Volume 1 at lulu.com/strangesound. Atmospheric elements create a dramatic backdrop. It’s like an organic space music. As it continues, more jazz-like sounds join the mix. The melodies are slow and deliberate. They are also quite pretty. The piece continues to develop gradually. In so many ways it’s a nearly seamless merging of jazz and space music. I love some of the piano soloing on this. The saxophone adds a lot, too. The rhythm section, and mostly the drums, open this in dramatic fashion. As it works into a melodic jam it’s more pure jazz than the opener was. It’s also more decidedly energetic. The group are positively on fire at times here as different instruments dance around one another. By around the three and a half minute mark, the jazz jamming gives way to a space rock styled section that’s more or less a drum solo with atmospherics over the top. That continues to evolve for a while. It turns to a more full arrangement before it ends. The bass starts this piece and holds it unaccompanied for the first 30 seconds or so. Then drums join and it’s strictly a rhythm section thing for a time. After the minute and a half mark, other elements join and this really does become a rock type of piece. It’s got a rocking edge and some space elements. It’s not far removed from something like Soft Machine in a lot of ways. There is still plenty of jazz in the mix, though. Then, it works out to a smoking full on jazz treatment from there. This continues to shift and evolve. There are some particularly dramatic, and almost symphonic rock moments. There are other sections that are pure jazz ecstasy. After a number of changes, it works to more pure progressive rock territory around the seven minute mark. It explodes back out into fast paced jazz from there, though. There is another percussion showcase later in the piece. The bass playing when it comes out of there is purely incendiary. Yes, this is jazz. However, this slow moving melodic piece could definitely pass for progressive rock, too. The piano solo is more pure jazz for sure. The saxophone lends more of that element, as well. Personally, I think the melodic section that takes it late is among the most compelling musical moments of the set. As that intensifies, it’s quite dramatic. Powerful jazz tinged with an electronic progressive rock sound is the concept here. This has a lot of energy and some great melodic vibes. The drums shine, but so does the piano. There are short sections that remind me a bit of some of Yes’ Relayer album. After the three minute mark we get a real electronic music laid over the top of a percussion workout segment. That movement takes the piece to its close. Percussion starts this. As it continues other instruments in, turning it into a mellow jazz treatment. Still, other elements come over the top, lending some electronic sounds. The piece grows outward in an arrangement that again makes me think of something like Soft Machine. The bass gets a chance to shine later in the piece. This moves forward as a melodic bit of jazzy progressive rock more than proggy jazz. 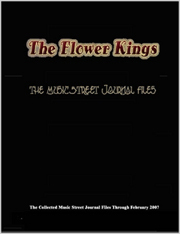 Coming in fairly slowly, this is a melding of progressive rock and jazz elements for certain. It gradually gets more intense and speedy as it continues. Around the four minute mark it drops back just a bit, but then powers up into some of the most potent jamming of the whole piece. Both the drums and the saxophone in particular shine, but the whole arrangement is on fire. Before the six minute mark a new section takes it into more pure jazz, and the piano really takes the lead. The jam continues to evolve with some smoking hot sax soloing taking over after a while. Space music merged with jazz opens this. It drops down to mellower motifs to continue. Although sedate, this is dramatic and powerful music. As it continues, it reminds me a bit of music to a science fiction or horror film. It continues to evolve, though. By around the three minute mark, there’s a great jazz jam with both a driving bass line and some killer piano. The keyboard sounds that come over the top of the mix still bring more of that soundtrack element to play. This works into more unusual soundscapes as it continues. Although this is a less involved arrangement, it’s not lacking by any means. It’s pretty and dramatic. It features Dylan Howe on drums and synthesizers, Ross Stanley on piano and the senior Howe on Koto. It’s got a real new age kind of mellow prog vibe to it.